The transatlantic slave trade, which lasted from the 16th to 19th centuries, found millions of people taken from their homes in central and western Africa and shipped across the ocean to work in the Caribbean and Central and South America. Toiling as unpaid laborers on sugar, coffee, cocoa and cotton plantations, in gold and silver mines, and as servants in houses, these enslaved people took with them the rich and vibrant cultural traditions of their homelands. Over time, as slavery ended and governments changed hands, these cultures began to blend with that of their colonial rulers (the English, French, Spanish, Dutch and Portuguese). In some cases, they also incorporated influences from the area’s native Arawak Indian populations, forging new fusions that stand today as a testament to the beauty of integration. 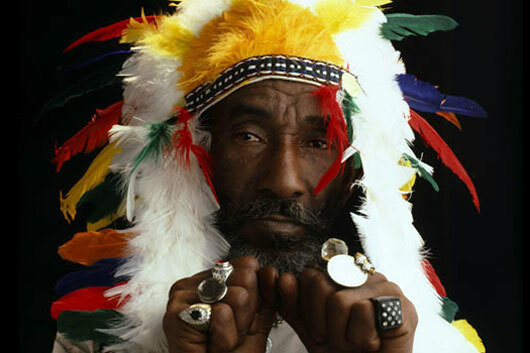 This is the reason Caribbean music styles and other cultural elements are so rich. The traditional music of Aruba– like that of its sister island in the Netherlands Antilles, Curaçao– combines classical influences from Africa, Europe and neighboring Venezuela. It includes a variety of waltzes (a ballroom style that originated in Vienna), danzas (a romantic style of music and dance native to the Caribbean) and mazurkas (originally a Polish folk dance). But the region’s most popular form of music is tumba, which is based on an African-derived rhythm and was created in the 1800s by Curaçao-born composer Jan Gerard Palm. 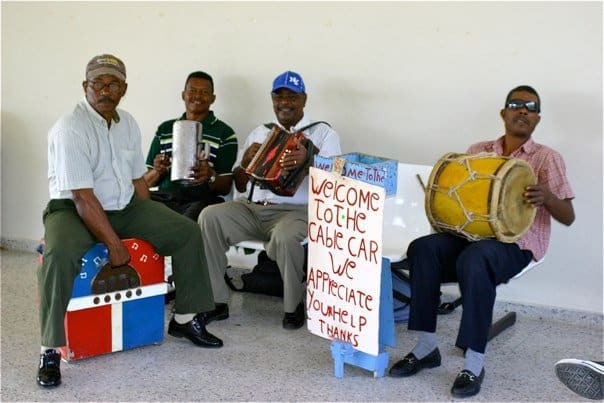 Other local music forms include tambú, which is sometimes called the Curaçao blues, and the seú, which was historically performed during the harvest festival and is accompanied by a graceful dance known as wapa. 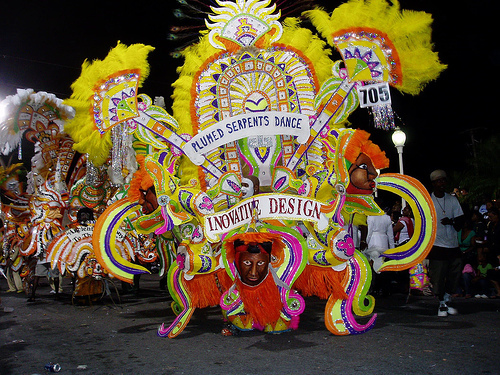 Though these islands have adopted imported music and dance forms such as calypso, reggae and soca, the Bahamas are primarily associated with the sounds of junkanoo. This Carnival-like celebration occurs every year on Boxing Day (December 26) and New Year’s Day. The word junkanoo is thought to derive from the name of Ghanaian leader John Connu, and its origins stretch back to the era in which slaves were only allowed celebrations around Christmas. By 1973, the year the Bahamas gained independence from the UK, black professionals had begun to dominate junkanoo, with costumes becoming more elaborate and competitions between various marching bands becoming more intense. With its brassy horns, syncopated percussion and festive whistles, it’s one of the Caribbean’s most lively and engaging musical forms. Colombia’s Atlantic coast boasts an amazingly diverse array of sounds, from the African beat of champeta and the Big Band horns of porro to the Latin rhythms of salsa. 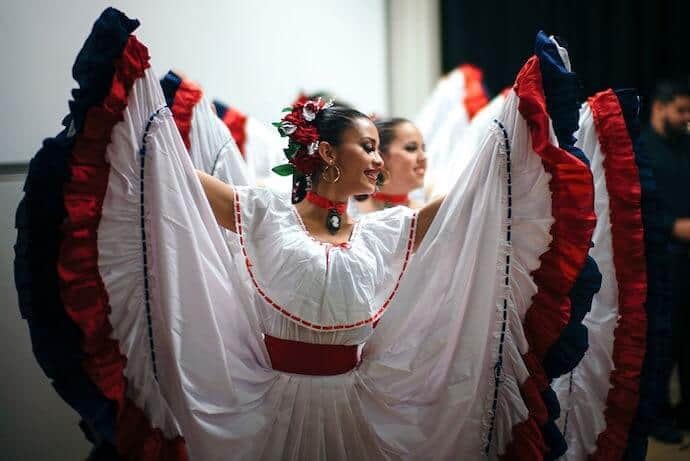 But the area’s most distinctive musical form is cumbia, a mixture of Spanish and African influences with an accompanying dance style designed to recall the shackles worn around the ankles of slaves. The complex, highly rhythmic music was originally comprised of just percussion and vocals, but has since evolved to include horn sections and keyboards as well. Spreading from rural areas to more urban centers in the 1940s, cumbia entered its Golden Age in the 1950s and remains popular in both Colombia and Mexico today, popularized by artists such as La Sonora Dinamita, Los Black Stars and Los Corraleros De Majagual. It’s interesting to note that, while Costa Rica does not have an army, it does boast a National Symphony Orchestra, a Youth Symphony Orchestra and two government-funded universities with respected music programs. As a result, the tiny country has produced more than its fair share of contemporary classical composers, including Alejandro Cardona, Bernal Flores, Benjamín Gutiérrez and Luis Diego Herra. 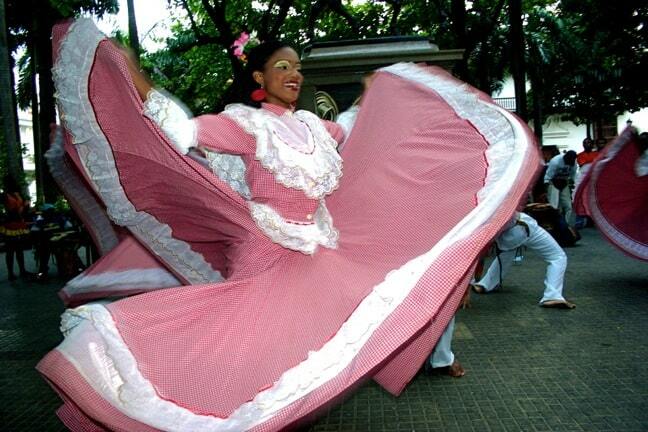 While the country’s most popular music forms– calypso, disco, pop, salsa and merengue– were all imported, there has been a resurgence of interest in the nation’s pre-Columbian folk traditions. Local bands such as Gandhi and Evolución have emerged as part of the Rock en Español movement, while Malpaís has had great success mixing Costa Rican folk with rock and jazz influences. It is virtually impossible to overemphasize the massive global impact Jamaica’s music scene has had on the world. This tiny Caribbean island has exported everything from ska and reggae to dub music and dancehall, influencing artists ranging from ’70s icons like The Police and The Clash to modern chart-toppers like No Doubt and Jason Mraz. Most music historians believe that hip-hop actually originated in Jamaica, where DJs “toasted” in rhyming patterns over a hypnotic rhythmic backdrop. A short-list of Jamaican music icons would include The Skatalites, Lee “Scratch” Perry, Bob Marley & the Wailers, Peter Tosh, King Tubby, Toots Hibbert, Burning Spear, Israel Vibration, Black Uhuru, Sly & Robbie, Gregory Isaacs and Shabba Ranks. All this influence from a country just 145 miles long by 50 miles wide! Though Puerto Rico has borrowed influences from the U.S., Cuba, Africa and Spain, much of the island’s culture comes from its original inhabitants, the Taíno Indians. 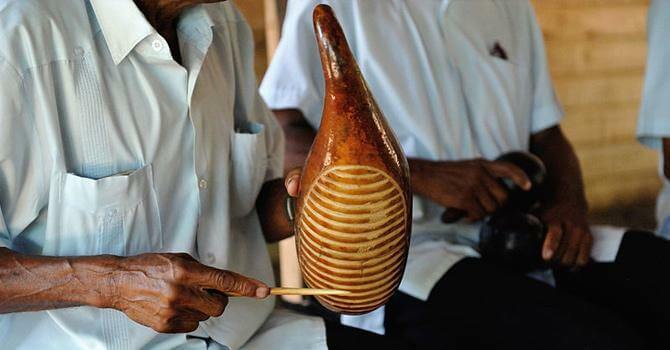 Commonly used native instruments include the guitar-like cuatro, güiro (the scraped wooden instrument pictured above), the cua (bamboo percussion), maracas, conch shell horn and panderos (hand drums). Each of these plays a significant role in folk music forms such as the West African-influenced bomba, Andalusian-influenced décima, the Spanish-style seis, and the narrative form known as plena. But the island’s most popular music form is actually the combination of Jamaican dancehall, American hip-hop and Puerto Rican rhythms known as reggaeton. Thanks to artists such as Daddy Yankee, Don Omar and Tego Calderon, the uptempo urban genre has put Puerto Rico on the global music map. Still, the island’s most beloved musical export may be legendary percussionist Tito Puente, the late master of the Latin Jazz sound. 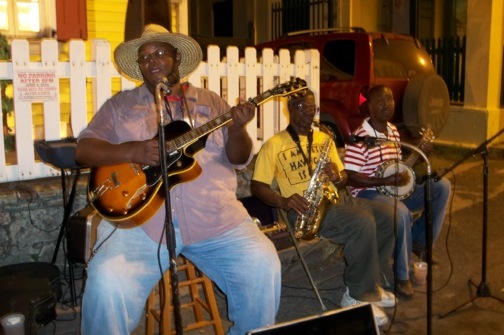 The USVI’s ties to its nearby island neighbors and America have led to a polyglot of popular musical styles, from reggae and calypso to hip-hop and even the marching band music of the military units once stationed there. But indigenous native musical traditions remain vibrant despite the influx of modern influences. They include the topical folk songs known as quelbe, the folk dance called the quadrille, and the African-derived bamboula. The strongest of these traditions are scratch bands, which play a form of music called fungi at church services, public festivals and weddings.